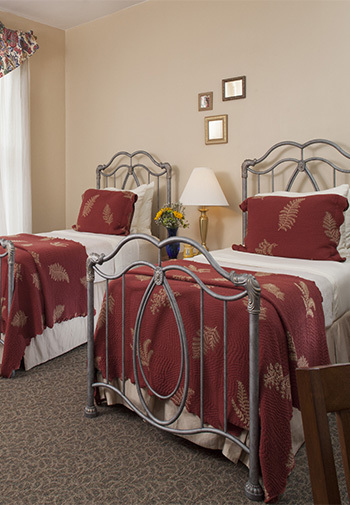 With accommodations for up to five guests, Bailey is a great place to stay for girlfriend or family vacation getaways in Central Pennsylvania. This spacious suite at Carlisle House Bed and Breakfast has two bedrooms, one with a queen and a twin bed, and one with two twin beds, full kitchen, living room and two private bathrooms, one with shower, and one with tub/shower combination. Double Occupancy rates for this suite vary from $249 to $309, according to the season. Up to 3 additional guests can be accommodated at $25 to $35 per guest, according to the season. If you prefer not to book online, please call us at 717-249-0350 or email us at Info@TheCarlisleHouse.com. The Bailey Suite on the 2nd floor front features 2 spacious bedrooms, one with queen and twin beds and one with two twins all in 670 square feet of space. The bedrooms overlook Hanover Street at the front of the suite, the first having two twin beds and large work area with Ethernet and wireless Internet connectivity, and the adjoining spacious Williamsburg blue bedroom features a dark rail queen bed with quality bedding, and a twin bed. It has a sunny yellow kitchen with refrigerator, ceramic top range, oven and dishwasher. It is adjacent to the living room in which the central focus is an original etching titled Farmland, an image very typical of the PA countryside. 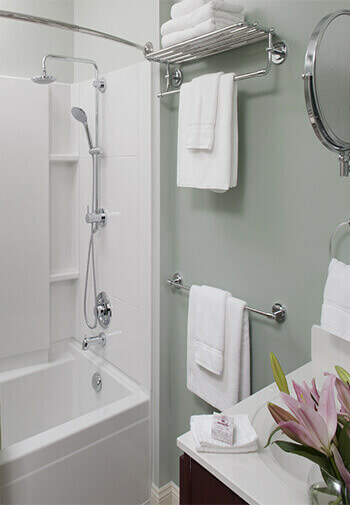 The suite includes two private bathrooms, one with a rainfall shower, and the second with soaking tub and Grohe combination rainfall shower and separate hand-held shower.